The object was independently discovered photographically by Paul Camilleri, Cobram, Vic, Australia, on Feburary 13.743 UT at magniutude 7.5. An earlier photograph made on February 6.739 showed notheing to magnitude 10. 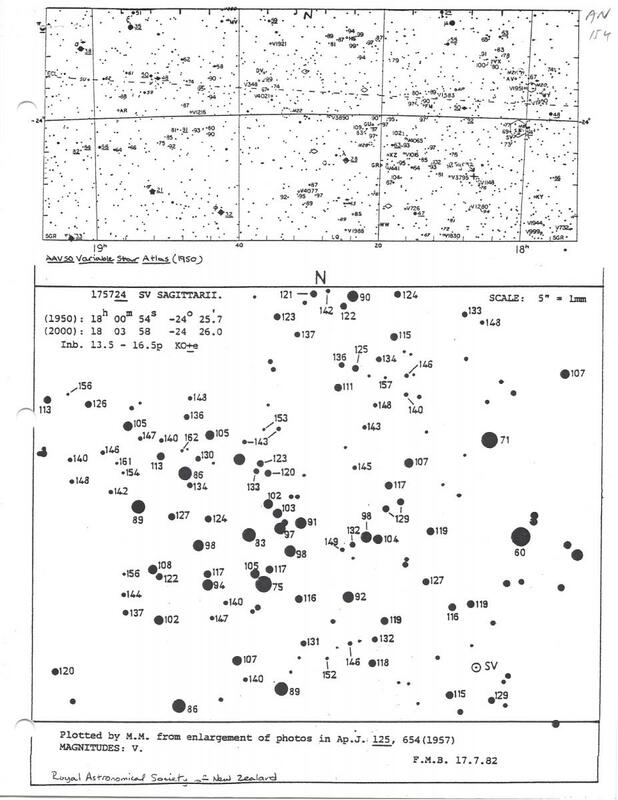 Accompanying is a finder chart from the AAVSO Variable Star Atlas showing the object. Also enclosed is a Royal Astronomical Society of New Zealand chart which gives a fainter sequence. Please use these charts to observe this possible nova, and report your observations to AAVSO Headquarters so we may inform the astronomical community. When you report your observations, please be sure to tell us which sequence you are using. Congratulations to Bill and to Paul on their discoveries! We have been asked once again to assist astronomers at the Planetary Science Institute in Arizona with their ongoing (i.e, there is no cut-off date) IUE observations of high-galactic latitude cataclysmic variables in outburst. As described in AAVSO Alert Notice 145, they are interested in monitoring the outbursts with IUE and in arranging simultaneous ground-based photometric and spectroscopic observations. The new list of stars in which the astronomers are interested is given below. The astronomers are still interested in any outburst activity of the stars on their first target list, included here for your reference. Please monitor these stars, and call in to Headquarters your observations of any you see go into outburst. Telephone calls to Headquarters in connection with the above request will be reimbursed by the astronomers. Please submit your telephone charges to Headquarters for reimbursement. Your close monitoring of the cataclysmic variables listed above and prompt reporting of any activity is critical to the success of these observing runs. I thank you very much for your efforts and for your valuable astronomical contributions.